Hello! Today I wanted to share with you a polish from the OPI’s new The Amazing Spider-man Collection. 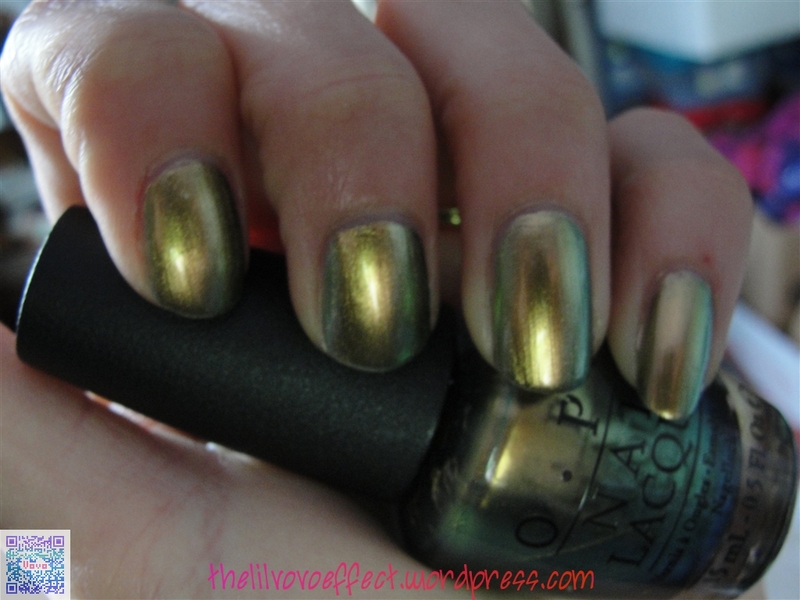 OPI Just Spotted The Lizard (JSL), is an awesome duo/multi chorme polish that reflects green and gold. It the bottle there is blue but unfortunately, that doesn’t translate onto the nail. :O Look at that bottle!!!!!!!!!!!!! OPI JSP is in 3 coats here and no top coat. Very good formula nice and smooth, I was actually expecting it to be a bit more sheer then it actually was. I really didn’t intend on putting so many pictures for this post but I really wanted to show how different it can be even in the same lighting. You can almost see the blue on the last picture. Just absolutely stunning IMO. This is one of those very few polishes that I felt like I HAD to have it. OK I don’t really need to say this because chances are- you already know. I’ve heard and seen that this is a dead on dupe for Chanel’s Peridot. I don’t have Peridot to compare it to, but if you search it online you will find lots of bloggers who do. SOOO that being said this is by far much cheaper. A very long but funny story goes with this and another polish from the collection. I had called the girls at the local beauty school- which is my closest OPI seller and requested they call me when this collection came in. When they called me 2 weeks later and I asked if they’d hold onto two bottles for me, this one- JSP and Number One Nemesis. I normally wouldn’t do this but I live in a very small town I’m actually 10 miles out of town. Long story short- my hubby went and picked up my polishes without me knowing, I didn’t have a car to get there in the first place but I was freaking out about getting there (which he let me do!!! in front of his friend btw) before they closed (it was in like away10 mins ATM) and just when I felt like I’d just have to wait until the next day he pulled them out of his pocket. For some girls this would be no big deal but my hubby HATES chemically smells- in fact all un-natural smells. So for him to first of go INTO the school, was shocking enough and then to buy NAIL POLISH?! Probably his worst offender? I’m not sure which he hates more- makeup or nail polish? Maybe aerosol air fresheners…Oh well you get the drift. I was beyond shocked. Whoa got off track! But here’s JSP with Kleancolor’s Coffee Addict stamped over it and Sally Hansen Insta Dri topcoat. This turned out just the way I hoped it would. Not too strong as to take away from the base color but not to light as to blend in and disappear. This isn’t my first time stamping but I do think this is my first post with my stamping featured…ummmm Oh! The image plate is a red angel RA-104, there’s two designs but its still the same plate. I bought my Red Angel’s on amazon.com! So what do you think of this color? what about stamping? Have you tried it yet?